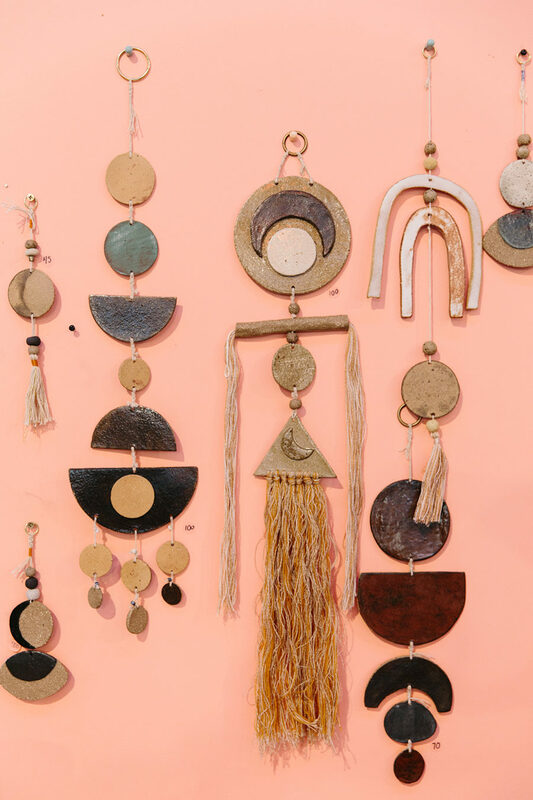 These New Year vibes have got us ready for new energy in the home – so we just had to re-share this interview with Kelly of Benna Co, whose dreamy ceramic wall hangings & tableware are high on our 2019 wish list! 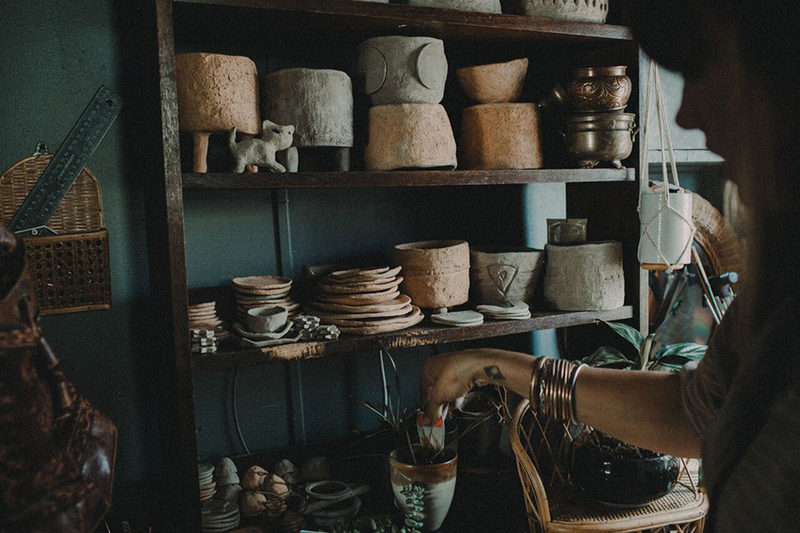 Benna co offers stoneware wall-hangings and planters inspired by the the earth, the sky, the ocean, the desert, the forest and almost anything ceramicist Kelly Murphy lays her eyes on. 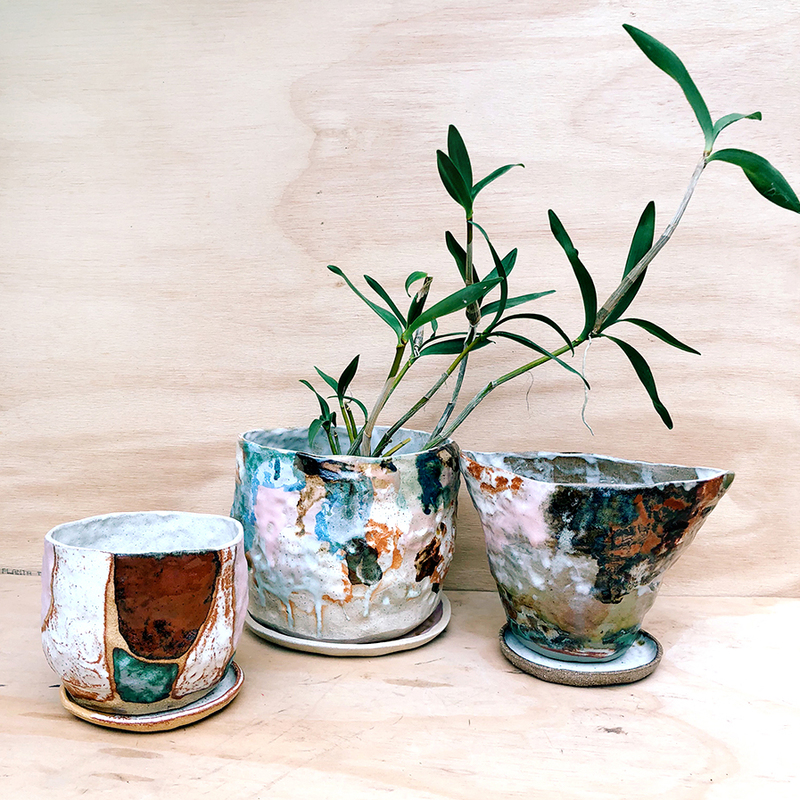 With a nod to the seventies and eighties, painterly glazes harmonise with earthy tones to create all-the-feels. We get the feeling collectors will love Kelly’s calming mix of unique pieces. 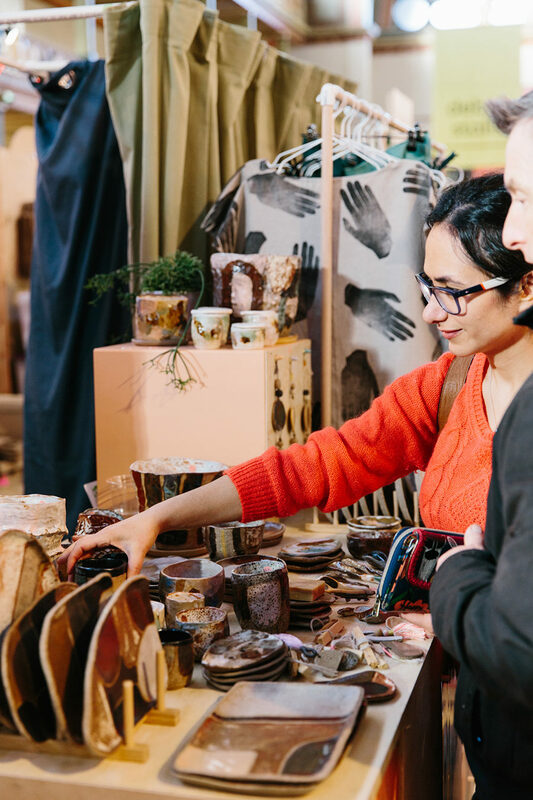 Benna co began as a kind of mish-mash of vintage furniture and homewares, plus handmade products made by me. 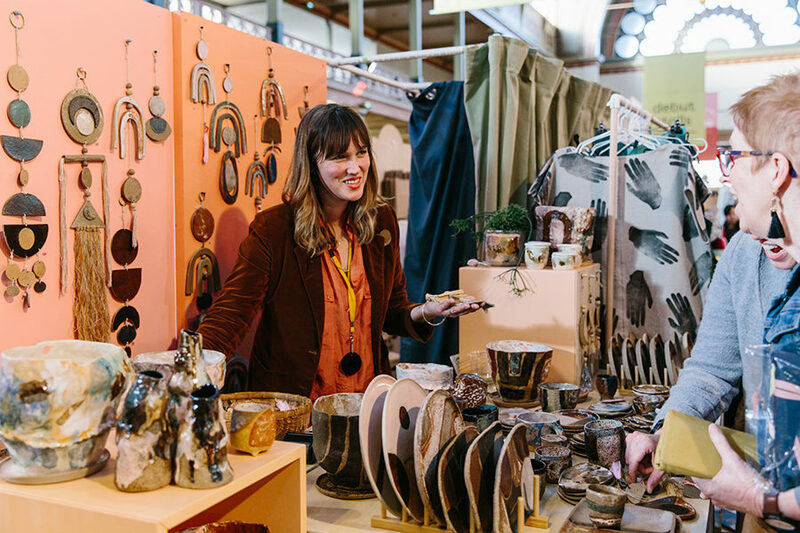 It was all the things that I loved doing – collecting and styling vintage homewares and indulging creative urges by making any and everything! In 2016 I was pregnant with my third baby, and so this slowing down time allowed me to focus on my interest in ceramics. It took off! Pretty soon after, it became the main thing that I do. I hand build pots and planters, plates and tableware and decorative wall hangings and mobiles from mixed stoneware clays and vintage yarns. Talk us through a typical day in the life of Benna co.
Benna co is a one woman show. 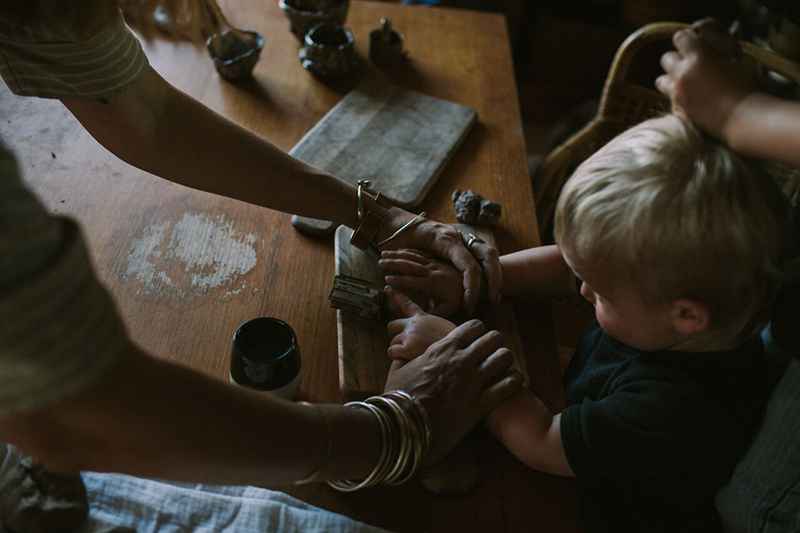 I work from home, and work around raising three small boys, which is a pretty tough juggle for sure, but hand building ceramics allows me to work from the kitchen table when I need to, and be in the backyard studio when I’m not taking care of little people. A typical day begins at 3-5am with many large cups of strong tea, and working madly to create before the family rises. Throughout the day I will do small tasks whenever I can, and on the few days that the kids aren’t with me, I’ll be hard at it in the studio. There is so much to be inspired by! Many painters such as Peter Doig, Gerhard Richter, Marlene Dumas, the Colour Field art movement, ancient art, Indigenous art, children’s art. My own kids are amazing intuitive artists and I’m always seeking to capture that free, unhindered expression of their touch. I’m inspired by the colours of the earth, the sky, the ocean, the desert, the forest. Absolutely everything I lay my eyes on can and does become a source of inspiration – its all about textures, colours and juxtaposition. I have always been fuelled by the creative drive, and I’m pretty sure that every act in my life on a day-to-day basis is informed by this creativity. 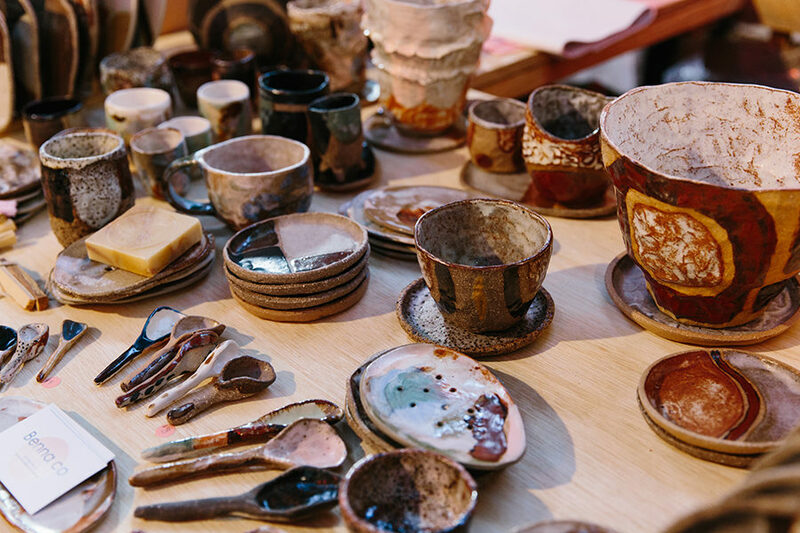 I think Finders Keepers is a great big melting pot of intense creativity, and there would be so much to admire from every designer, who has worked extremely hard to hone their craft and bring it to market. There are two designers that spring to mind- I absolutely love the sustainable approach of Kirralee & co who use timber offcuts in such ingenious and creative ways. Kirralee’s work struck a cord with me back in the days before I was focusing on ceramics, when I was building furniture out of discarded timber. As a society we are creating epic amounts of waste and its so heartening to see people use their creativity to see waste as the resource that it is, and turn it into something incredibly beautiful. I’m also quite impressed by the excellent business model of Halcyon Nights, who collaborate with amazing designers to come up with the sweetest prints on their bedding and children’s wear. Over the next five years I plan to continue to develop my practice and explore the contrasts between clay and glaze. It is an endlessly inspiring medium, and I could spend a lifetime learning it’s ways. I hope to set a fully functional studio that incorporates all aspects of my practice, from ceramics to woodwork, painting and more. I’m pleased to say I’m on track so far!